Hi, I'm Freelance Python Web developer Olly Cope. A Python expert from Liège, Belgium. Looking for a Freelance Python Developer for hire? My expertise has delivered successful web applications for Protectivity Insurance, Tutti Classical Music and Kingston University. Hire me and I can make your Python project a success too. Why hire a Freelance Python Programmer? Hiring a freelance Python developer means you get exactly the skills you need for the time you need them. Not everybody has the time or skills to become a successful Python freelancer. I have refined and optimized my development practices over 100,000s of lines of code delivered for over 170 freelance and open source programming projects. As an expert python programmer for hire, I have the proven skills and experience to start providing value to you straight away. Instantly add 17 years Python Web development experience to your team: if you are looking to hire a reliable freelance python programmer I am here to help. Worried about unreliable freelance developers? I've seen it too often: the freelancer who promises too much then just can't deliver, making your project late and costing you time and money. I've been freelancing since 2006 and I really know my stuff. I know my limits: I'll never promise you anything I can't deliver and I'll make sure you are kept informed every step of the way. Development projects are unpredictable. It's my job as an expert developer to help you navigate them. My expertise and experience means that I can head off a lot of surprises. If I do hit unforseen issues, I'll tell you up front and give you options for dealing with them, rather than landing you with a surprise bill. And I'll do everything in plain language – I never hide behind tech jargon. Oh, and all my development work is guaranteed for 6 months from delivery. It's written into my contract. Sounds good? Have a look and see if I could be a good fit for you. Bring substantial Python programming and web development expertise to help you translate your business requirements into a smooth product launch. Help you to use technology efficiently to spot new opportunities and avoid potential pitfalls. Work all-out to make sure your investment leads directly to a successful outcome for your team. Every project I craft is carefully matched to my client's needs. 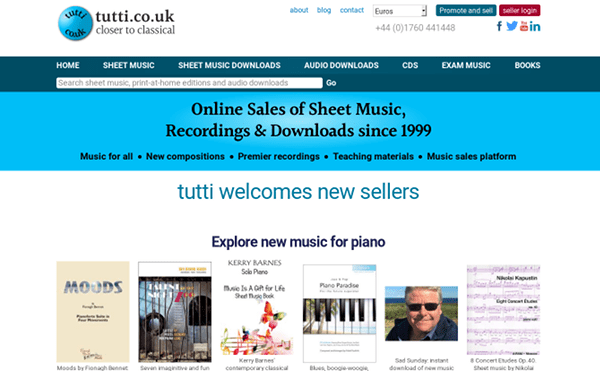 Tutti is a specialist classical music retailer serving a niche market. I worked with tutti's business owners to understand the precise needs of musicians using their sales platform, and took care to match that the work I produced to these needs. I continue to work with tutti, improving their web site's user experience, search rankings and conversion optimization. I work on a retainer agreement as tutti's lead developer. I work directly with the founders and liaise with other developers, designers and marketing specialists as required. Whatever the project, I approach it with a conscience. Every freelancer must make dozens of choices affecting the performance, budget or impact of the project. I always stay aware that it’s your budget and your business that you have trusted to my judgement. Sometimes my conscience takes me in other directions, too. Climate change is a serious, immediate threat. 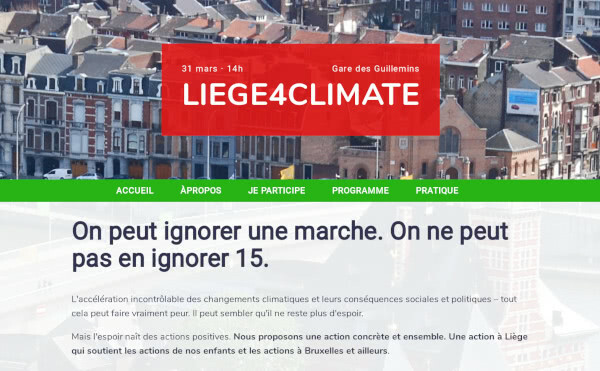 Rather than stay ignorant or scared, I decided to give my time and expertise to help bring together people from around the Province of Liège in support of rapid action to limit CO2 emissions. This site is backed by a headless (API-first) CMS, so is easy for the event organizers to keep updated. 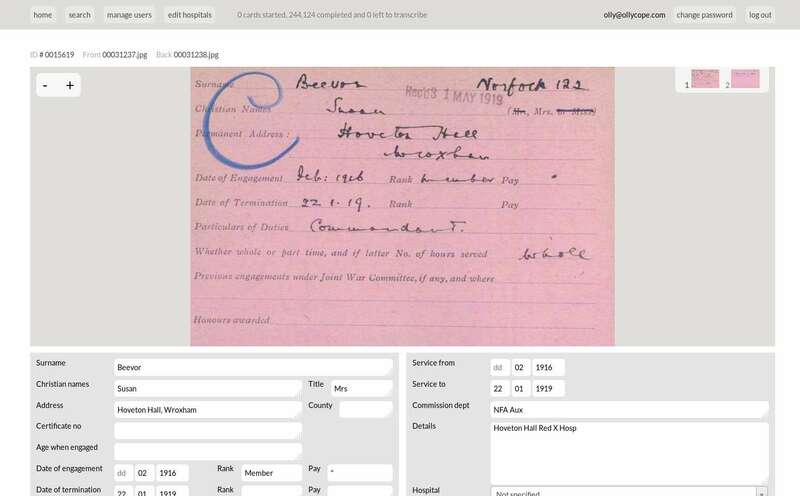 For Kingston University I helped create a collaborative transcription system, allowing volunteers to crowd transcribe thousands of handwritten Victorian and Edwardian medical records from hospital archives across the UK. Because my code was flexible and extensible, when a major UK charity approached us with an large scale transcription project for their first world war archive, I could repurpose the platform at minimal extra cost and scale it up to meet the needs of over 1,100 volunteers transcribing 244,160 first world war records. You can see the results here. This transcription system was developed over the course of several self-contained projects. In each I was the lead developer for the transcription system, liaising with in-house management, development teams and external service providers to deliver the finished product. 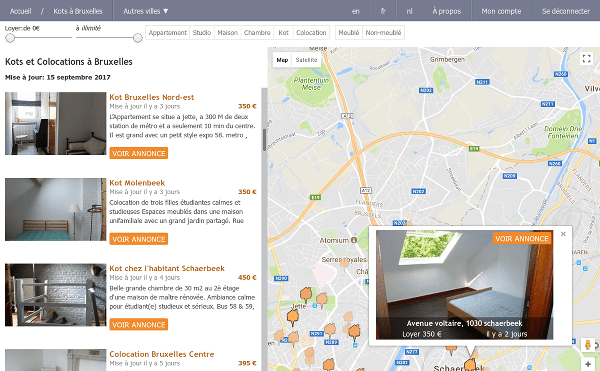 My experience of web application development and focus on research and user testing helped build skot.be into one of the fastest and easiest to use student room search sites in Belgium. Highly optimized code and a thoughtful approach to user experience are major contributors to its success. This is a personal side project, developed over the course of several years. In partnership with HelloKot, a Belgian startup, I am now expanding this platform into new markets. My clients are mostly UK or European organizations who are comfortable hiring remote workers. I am a British born developer living and working in Liège, Belgium. Typical engagements run from £1,000 - £25,000. I can work either at a per-project rate or a daily rate. I limit myself to a small number of engagements to be sure that I can give your development the attention that it deserves. This means I often have work booked several months in advance. If you are interested in hiring me, the sooner you contact me, the sooner I can save you a spot in my schedule. Please reply to me at your earliest convenience.